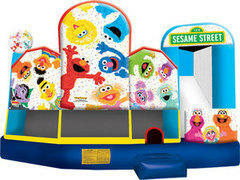 DIMENSIONS: (19W x 20L x 15H) Help guests get to Sesame Street with this awesome licensed 5-in-1 combo bouncy castle! All the beloved Sesame Street puppets are featured: Big Bird, Elmo, Cookie Monster, Grover, Abby Cadabby, Bert and Ernie and more, even a three-dimensional pop up from Oscar the Grouch. Kids can choose from five different activities in this neighborhood, and can spend time sliding under the Sesame Street street sign. This popular line of licensed Sesame Street inflatable products includes jumps and combos sure to please kids of all ages. The 5-in-1 combo style bounce house is the ultimate in inflatable jumpers! The large interior jumping area offers a basketball hoop and both log and pop-up obstacles. This bouncy castle has a climb feature and a convenient exit slide for hours of active fun! Parents and spectators are offered a clear view with the 360-degree mesh sides of this moonwalk. The 5-in-1 combo bounce house is made of lite n strong™ fire-resistant vinyl for safety, durability and easy portability. This 5-in-1 bouncy house is sure to make any indoor or outdoor event a great success!